Fynbus is the regional bus authority at Fyn and is owned by 10 municipalities. Fynbus offers Demand Responsive Transport (Flextrafik) that is an option for citizens who are unable to use ordinary public transport to get to school, an institution or treatment. The operation of the busses is handled by subcontractors, while Fynbus takes care of the scheduling and planning of the 500.000 annual trips. The scheduling is performed using Rapidis Logistics Planner, which will ensure that the schedules will comply to complex demands and constraints within Demand Responsive Transport. At the same time, the scheduling process ensures that the resulting routes will be as cost efficient as possible. With a vast amount of daily trips, there will be daily changes in the passengers need for transportation. Using Rapidis Logistics Planner it only takes minutes for Fynbus to rerun and update the schedules with the changes incorporated. Download PDF case story about how the Regional Transit Authority Fynbus uses Logistics Planner for DRT scheduling. Washa offers to pickup your laundry, take care of washing and dry cleaning and return your shirts and sheets to your location. This is a service appreciated by many costumers; so many that Washa has now implemented Logistics Planner for automated scheduling and route optimization. With Logistics Planner Washa has managed to increase the number of pickups and deliveries from 8 to 12 per hour for each delivery van. As a positive side effect Washa can now plan and optimize for the entire fleet within minutes – something that they used spend 10 office hours doing. Washa costumers decide what 1 hour time slot they want pickup or delivery. Therefore Washa has even expanded their use of Logiscs Planner to dynamically price delivery costs making it attractive to clients to choose a time window where Washa has other stops near by. Download Washa Case Study and explore details about how Washa benefited from in-cooperating Logistics Planner in their operation. Rapidis has delivered system that enables Falck to create long-term load forecasting for the work-load on their many fitters and service technicians. The forecasts are based on operational data coupled with detailed simulation calculations. Falck Teknik also makes the daily planning and scheduling for technicians with Rapidis Logistics Planner. Special functions that handle tasks that shall be performed every 2, 3 or 4 months, has helped to optimize the planning, so the total drive time for all the technicians is reduced significantly. Sweco, an engineering company with offices in several countries, offer the software suite Renoweb that handles all aspects of waste management for cities, municipalities and contractors. Even costumers and citizens can communicate by using the platform. For residential waste collection Rapidis has calculated and optimized routes for entire cities and municipalities. Subsequently Sweco has imported these routes into Renoweb. 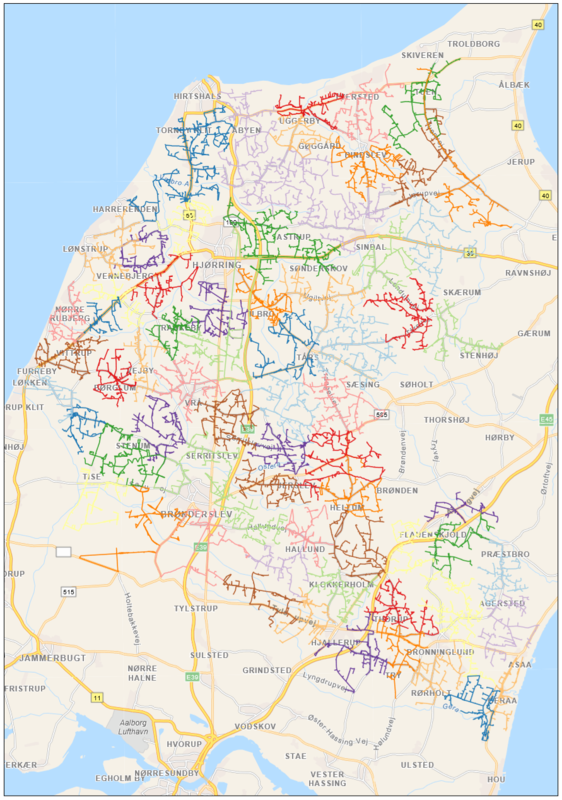 The system produces detailed routes based on a GIS road network and address data. In order to handle large areas the system automatically groups addresses into larger segments before starting the optimization calculations. This lowers the calculation time and makes it possible to handle large areas at a time, containing hundreds of routes. AVV collects residential waste from all households in the municipalities of Hjørring and Brønderslev in Denmark. In total 40.000 addresses are served by AVV for residential waste collection. Rapids has assisted AVV with planning and optimization of the many routes ensuring that the waste collection is done as efficient as possible. Routes and route sequences are optimized so both drive time and KM are minimized for the fleet of dumpster trucks; as a result both the fleet size and total costs like fuel consumption and carbon footprint are minimized. The Rapidis delivery is a series of overview maps, address lists and detailed maps for every route together with many informative key figures. Finally the routes are imported to the Renoweb solution (delivered by Sweco) that is the Waste Management IT solution used by many cities and municipalities in Denmark. Mover has created an IT platform that connects the demand for transportation of goods with drivers who have spare capacity. In less than 3 years, almost 10,000 drivers have registered as Mover drivers, offering both courier- and distribution services for businesses and private costumers. An important parameter for the Mover success is that Movers’ systems can plan and assign tasks to drivers very efficiently. To do so Mover uses several components from the toolbox that Rapidis offers for route planning and fleet optimization. As an example Mover offers to take care of distribution for businesses who can upload the pool of stops that the need taken care of. Routes are automatically calculated and optimized letting the costumer know exactly how many delivery vans will be needed. Now customers can order exactly the capacity they need and pay for exactly that. At the same time drivers will receive a fair price for their services. 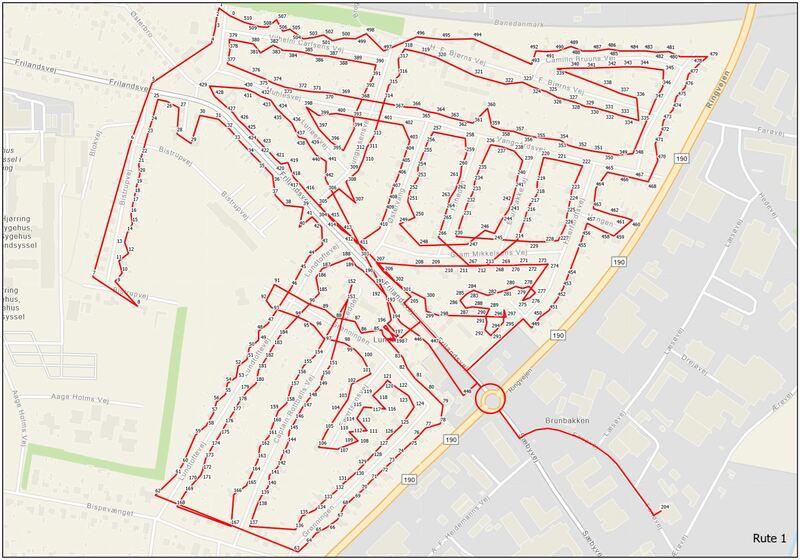 Together with our partner, Partex, we have assisted bus operator Bergholdt.dk with the implementation of a solution for automatic route planning of the paratransit that Bergholdt.dk does for the Municipality Svendborg. Rapidis supplies the logistic planning software, which Partex has made accessible from their adminstrative software Easy@Tour, which is used by many bus operators in Denmark. For the bus operator this means that he can keep his current administrative software and at the same time obtain new functionality for planning and optimization in paratransit. The Tax & Customs Service (Told & Skat) has chosen a FleetView-based solution for the automatic calculation of Commuting routes and distances for all tax payers, in order to automatically calculate deductions for taxpayers. The solution, which consists of various extensions to FleetView Route and integration with WebSphere MQ was developed by Informi GIS and Rapidis.